Quality control is important in all aspects of fireworks design, including color formulation. Impurities and contaminants in the chemicals can completely ruin the effect. For example, even trace amounts of sodium in a chemical mixture will produce a bright yellow color that can drown out weaker colors. You know how a stove burner is dark when its relatively cool, red when its hot, and white-hot when you turn it all the way up? This is incandescence of the heating element, which is light emitted by the element as it gets hot. Fireworks also rely on incandescence for special effects and colors. Certain chemicals are red, orange, yellow, and white when heated. In particular, metals are heated to produce colored sparks, glitter, and fountain effects. Titanium, iron, and aluminum flakes are common metals heated to incandescence in fireworks. 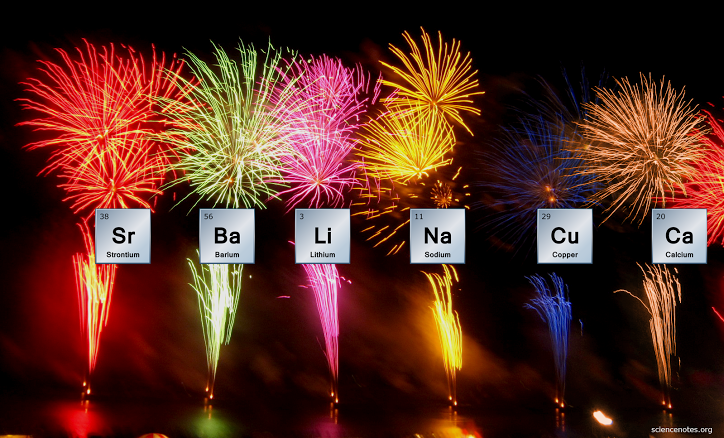 Here’s a handy periodic table you can print that shows the principal elements used in fireworks. 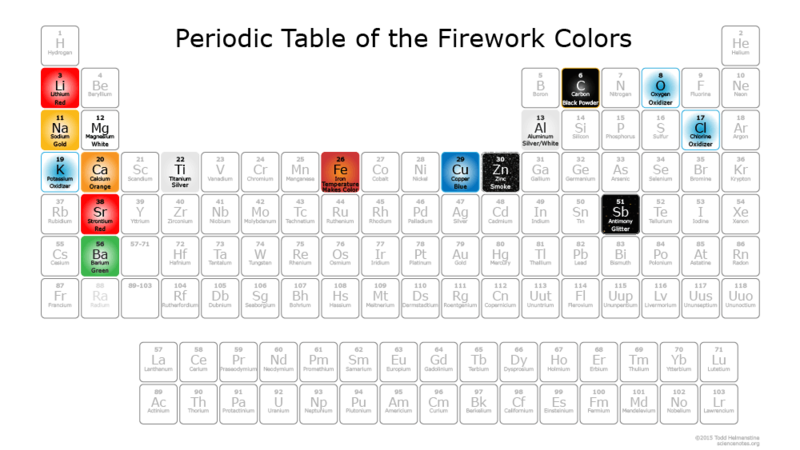 The table is color-coded, so you can see at a glance which colors are produced by heating certain elements. Interesting and increases knowledge of chemistry. I always prefer to read your e- mails first then the other. Very interesting indeed. May there be any chance of an experiment I can do with a mini firework or something like that?